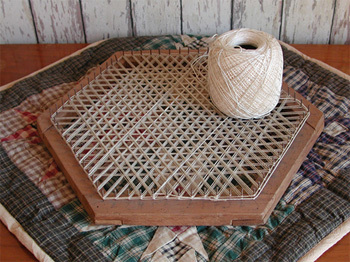 The knitting frame creates a web of flat knitting, such as the scarf in progress. 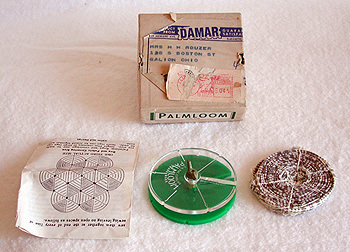 This operates like the old knitting spools or the modern plastic circular frames by pulling loops of yarn over pegs. There is a rod inside that the knitted item can be wound up on and with the bottom board slid back, the work would stay nice and clean. There are no manufactures marks, so we are unsure of it's origin. These weaving frames came in both wood and metal, rigid and adjustable, large and small. This one came home with us when we discovered the manufacturer's stamp on the back. It was made up the river from the Brown House in Parkersburg, WV. 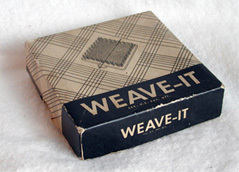 Weave-It looms were made by Donar Products Corp., 200 Boston Avenue, Medford, Mass. One can weave a 4-inch square. Larger items are possible by joining several smaller squares. 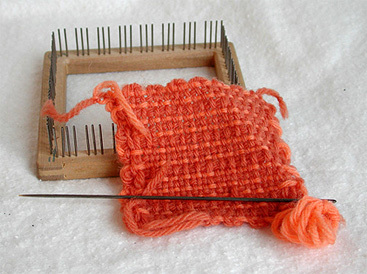 To make a basic square, thread is wound in three directions and then the needle weaves the fourth direction. The included instruction sheet gave directions for diagonal and herring-bone weaves. This invention of the mid 1900s was used to convert your old rags into rugs and other household items. 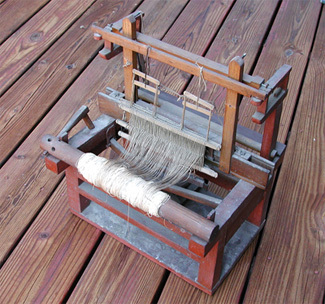 Strips of fabric were wound around the spindle of the plastic loom. The example on the right shows lines of sewing that held the fabric in place. The fabric disks were then sewn together in a hexagon pattern to make the rug. Two balls of string hold half-hitched 3 inch by one-half inch strips of rag material. The instructions recommend yarn or old rag material like old silk stockings or dresses and underwear. The long string of rags was then sewn together to make a warm rug. In days past the rag bag hung on a convenient nail and bits of fabric or worn out clothing was tossed in and saved to be sold to the ragman. In the early 1900s your saved wool rags could be made into a beautiful new living room rug. We are guessing that this is a salesman's sample. Its base measures 8 x 13 inches. It can (and has) been used to weave on, but we prefer to just have it on display in our family room. Without some frame of reference, it would be difficult to estimate its size from the photograph. We think that this is a loom of some type, but have no clue as to its use. A string was wound back and forth around the staples on the edge and under the steel rod. 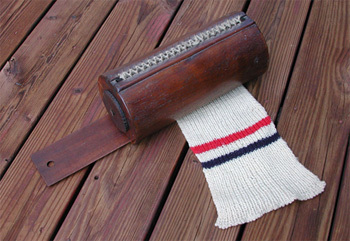 Once the rod was pulled out, the weaving would be released. The wood base measures 9 x 15 inches. Hattie L. Hall's name is on the reverse and we purchased it at Dutch Valley Antique Mall in Knoxville, Tenn.